Though Halloween and Thanksgiving still stand between consumers and the biggest holiday sales, it's nonetheless the season for retailers and analysts to anticipate holiday gaming purchases. Nielsen, for its part, has released a ranking of the most anticipated games of the coming holidays, showing Call of Duty Black Ops 4 just edging out over Red Dead Redemption II in a survey of nearly 6000 people. The survey looked at metrics like awareness, purchase interest and consumer rating for 82 different games due for release between September 1 and December 31 of this year. 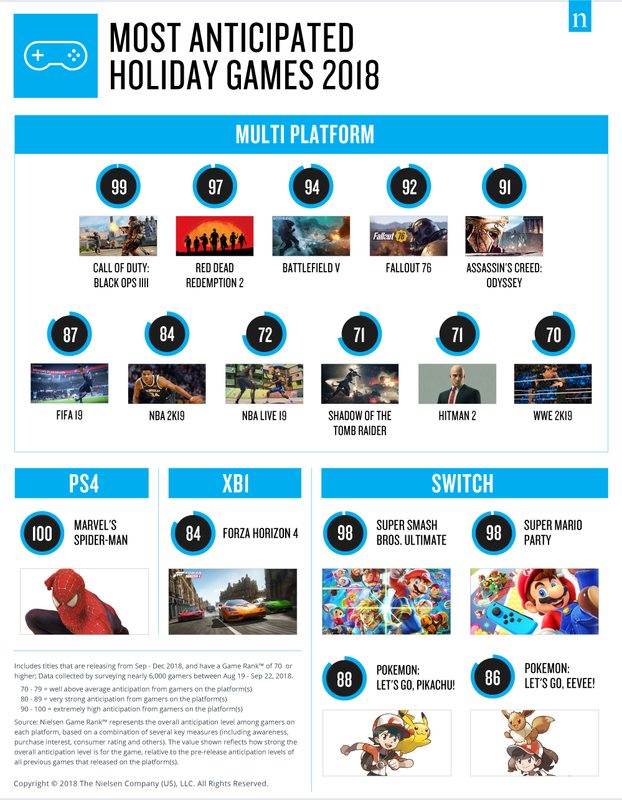 Based on those metrics, Nielsen assigned a "rank" to each game, with multi-platform titles combining individual platform rankings for one final score. At the top of the multi-platform rankings is Call of Duty: Black Ops 4 with a score of 99 - just two points ahead of Red Dead Redemption 2. Just behind them are Fallout 76 and Assassin's Creed Odyssey, both with ranks above 90, and below that are a number of sports titles capturing holiday interest: FIFA 19, NBA 2K19, NBA Live 19 and WWE 2K19. For platform exclusives, Spider-Man is the clearest and only reported leader for PS4 with a ranking of 100. Forza Horizon 4 on Xbox One doesn't generate quite as much interest at an 84, but it's also the only representative for its platform in a fairly quiet holiday season for exclusives. And unlike last year, there are no ranking PC-exclusives in Nielsen's list. Not so for the Switch. Nintendo's console has multiple exclusives sharing interest, with Super Smash Bros Ultimate actually sharing the top spot with Super Mario Party at 98. Behind them are Pokemon Let's Go! Pikachu and Eevee, with the electric mouse mascot managing to beat its fluffy compatriot out for interest at 88 to 86. The Nintendo 3DS, like PC, is absent this year, with its only major release (Luigi's Mansion) not making the list at all. well, one anticipates a great many things, none of which have to be pleasant by default. I know there was some controversy around Activision's decision to not include a single player campaign this time around but I have a feeling that won't dampen sales much. This will probably fall in line with most Call of Duty sales figures. I preordered mine yesterday and can't wait to dive into the new battle royale mode.